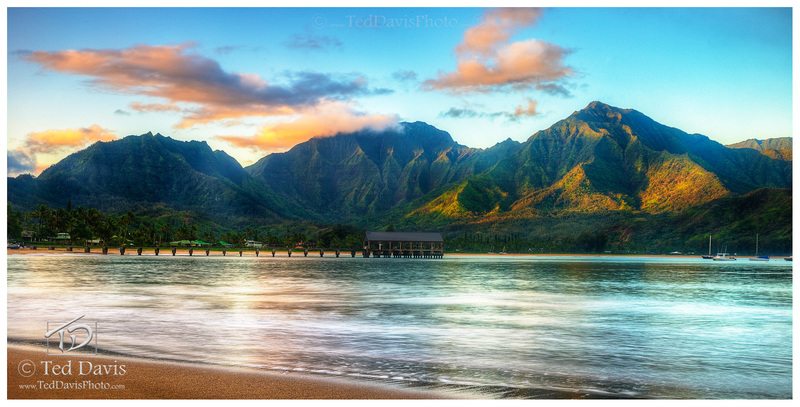 The rising sun over Kaua'i can make even the most beautiful landscapes drop-dead gorgeous. Standing in the shifting sands as waves slowly brought the tide in, I wanted this sunrise shot. With the Hanalei Pier featured along the bay, the sun began one of the most dramatic and stunning light shows in the clouds and along the mountains of the valley. The pastels of the light reflecting in the bay put an exclamation point on this glorious morning. Photo © copyright by Ted Davis.